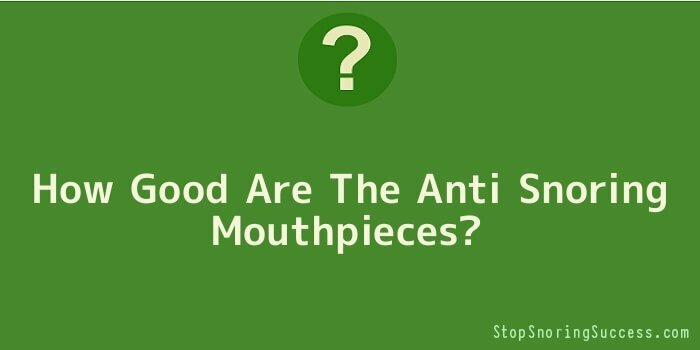 How Good Are The Anti Snoring Mouthpieces? How do you know if an anti-snoring mouthpiece works best for you? One thing for sure is that you have to get yourself checked by the doctor. That is because no amount of snoring mouthpiece can help resolve a snorer’s concern unless he knows the root cause of it. As we all know, snoring may be brought on by a lot of factors such as obesity or it could be heart disease. When one is obese fats tend to get in the way of the airflow which causes the vibration and that horrible nightly noise that you hear. The main idea in resolving the snoring concern is to make sure that the air passage is clear enough for air to pass through without disruption. That is how a snoring mouthpiece works. It sets the jaw in a certain position wherein the air passageway is clear enough for the air to pass, which results to less vibration and no noise. There are also those that keep the jaw slightly open so as to make sure that the soft palate doesn’t touch or fall back on the throat. In this way, you can be sure that it won’t be creating a vibration and hence no noise as well. There are certain good things in using a snoring mouthpiece to eliminate your snoring. One is that it is easy to access. You can buy it over the counter, unless you think you need a custom fit one. In that case, you would need the services of a dental professional to create a mouthpiece that will suit your form and shape of the mouth. Such devices are not only accessible; they are also quite cheaper compared to other remedies for snoring. This could also be perhaps the most basic of them so if you have severe snoring, the doctor’s recommendations would weigh more than the advantages of the usual mouthpiece. Another thing is that it has a high rate of success compared to other means of resolving snoring. Although you can enjoy great benefits from this tool, you should also know the downsides to it. One is that you may have to get used to it before you can actually enjoy its benefits. The catch here is that it may take quite a while to happen. Additionally, just like many other snoring devices you can find, they are not the permanent fix to the problem. Eventually, you would need to undergo a much deeper treatment option or even surgery for those very severe cases. There are not many permanent treatment options. In fact, the only permanent treatment for snoring is surgery but this is very costly. And also with this option, you can’t be guaranteed of absolute safety. There’s also a simple solution option which is to exercise the throat area so as to strengthen the area of the throat and makes way for air to pass through without obstruction or vibration at that. The best thing is that this can be a permanent thing for as long as you do this religiously every day for a specified time in a span of two months.